WE loved the condo it was very comfortable and clean and the sunsets were wonderful. We will try to rent this place every time we come down! Loved every minute of it! Amazing penthouse! Didn't want to leave! We loved the ocean view and the overall stay! We can't wait to be able to come back and stay again soon! On our arrival day, we were close to Pensacola but it was about 4:30 and one of the team members called to make sure we were going to make it there before 5:00 and gave us instructions on what to do if we didn't make it there before 5:00. Check out was really smooth and easy. We loved our stay at Navarre Beach! I felt so relaxed at the end of our time there and I'm ready to come back! Loved it! House was nice. Everything worked as it should. Every was very nice and helpful. 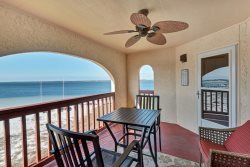 We absolutely love coming to Navarre Beach and Navarre Properties does a great job with the condos. We had everything we needed for our stay. Enjoyed our stay very much and will be back to this very same condo. A positive fun vacation for extended families. What a beautiful place to bring your family!